Take a look at the image of maple attached. What would you name this disease? Tar spot fits perfectly; and this is a disease that most can identify without the aid of a microscope or diagnostic lab. The disease looks like drops of tar on the leaves. Some species cause large lesions as in the image. Others have more of the appearance of being speckled with tar. Tar spot of maple is caused by fungi in the Rhytisma genus, Rhytisma americanum (as in the image), R. punctatum, and R. acerinum. 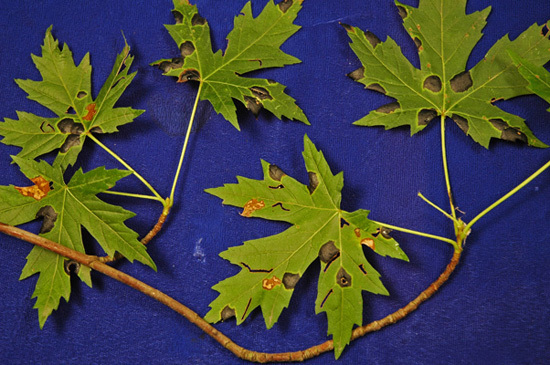 Each is known to cause slightly different sizes of spots on various maple species. Moist conditions as leaves are forming allow infection, so this is another disease that has been more intense in 2009. Actually, the disease is most likely in moist areas where the leaves remain as part of the soil litter. This disease may cause some early defoliation if severe, but even then it is not believed to significantly impact tree growth and development. I had not seen much of this disease in the Champaign-Urbana area until I was shown a silver maple on campus. The image is taken from a silver maple tree located on the University of Illinois horticulture farm. Evidently this tree is infected every year with no ill effects other than unsightly spots. It is in a naturalized location.